Who is Ben Reeder: The Man Behind the Camera? To start with, I have been a photographer for about 20 years and received my first camera as a high school graduation gift from my sister. For me my greatest accomplishment is not the number of weddings or photographs that I have taken throughout the years, but the endless connections with people I have made along the way. I have developed some lifelong friendships as a result of this profession. Being a photographer has never been just about the job or profession. It is something that I am passionate about, which you will see as you view my website and depicted within my work. Photography is very dynamic and deserves a commitment as a lifelong learner. I continue to learn from each shoot because there is not one that is exactly alike. I enjoy the diversity that photography affords, which is not present in all professions. I am given the unique opportunity to share and capture some of the most precious and intimate memories with couples and families. 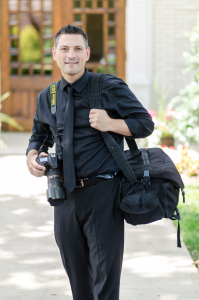 When I tell people what I do, people often become most intrigued that one of my specialties is wedding photography. Weddings hold a special sentiment for me. I believe each couple, who is lucky enough to find that one special person to spend a lifetime with should have photos that narrate their love story, can be shared with others, and cherished for generations. My eye for photography and the beauty that I see behind the lens is truly a gift and an art that continues to evolve. Photography is not something that I will ever tire from because of the vast experiences that I share with others and my ongoing commitment to make a lasting imprint within this field and to build my skills, business, and brand. I have included a photo of my wife, Allison and I because she continues to inspire my work and provides unconditional support. I was lucky enough to also find that one special person to spend a lifetime with and yes we do cherish our wedding photos. I invite you to check out my site if you have not yet and feel free to leave me a message or comment. If you are looking to hire a photographer for a wedding, engagement session, professional or family portrait please do not hesitate to contact me. I would be happy to talk with you, answer your questions, and provide any additional information.